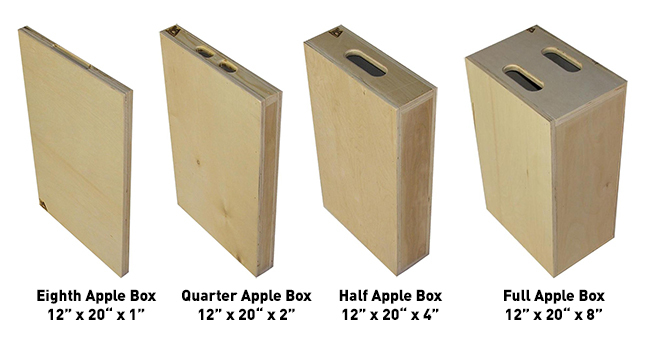 Apple boxes are a useful set of different sizes of support or height-raising devices intended to hold a significant amount of weight. There are 4 sizes; Full apple, Half apple, Quarter apple and the smallest thinnest size is called the 'Pancake'. Apple boxes are useful for rasing individual obejcts in front of camera so that they appear more pleasingly spaced, arranged or elevated to the angle of the camera. They also make great seats. The Full Apple Box and it's three sides have standard dimentions of 20" x 12" x 8". The Half Apple Box also has the same first two dimentions of a full apple, but it's shorter side is a reduced measurement of 4 inches. The Quarter Apple Box has the same longesr side measurements as the full and half apple boxes but it's 'first' side measurement is at only 2 inches. A Pancake or "Eighth" Apple Box also has the 20" x 12" dimensions but it's third side measures only 1". First side - Lowest postion when placing a full apple box measuring 8 inches in height. Second side - Medium height position of the full apple measuring 12 inches in height. Thrid side - Highest position possible when placing the full apple box measuring 20 inches in height. The Full Apple box is quite simply, most often used as a seat (sometimes referred to as a "grip-to-ground adpater"). Other uses for people are when you place an apple box for someone to stand on (sometimes referred to as a "man maker").